Executive chef of the Optimist, Josh Coker is dedicated to bringing fresh, high-quality and sustainable seafood to landlocked Atlantans. The Alabama-native transforms traditional recipes into the restaurant’s award winning, fish-camp inspired menu, drawing inspiration from his Southern roots. Starting out as a prep cook at JCT. 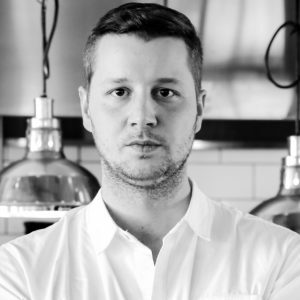 Kitchen & Bar, Coker has experience in nearly every back-of-house position within the Ford Fry family, including the kitchens at King + Duke, BeetleCat and now the Optimist. His desire (and ability) to learn quickly has been the backbone of his career and influenced the way in which he conceptualizes his dishes. Training under Ford Fry Restaurants’ VPs of Culinary Drew Belline and Kevin Maxey not only helped mold his culinary foundation, but also heightened his desire to grow and refine his craft. Coker considers maintaining “local” and “sustainable” ingredients a passion project. He sources and works with like-minded fisheries, hatcheries and farmers to heighten the Optimist’s culinary approach and think creatively to serve the freshest (and tastiest) seafood available. In order to motivate, excite and shape the chefs on his team, he encourages studying trends, water ecology and staying up-to-date on various farms across the country. On the rare occasion that Coker is not in Optimist’s kitchen, you can find him visiting other restaurants, fishing and cheering on the Auburn Tigers’ football team.